A.R. Gurney is also a featured playwright this season at off Broadway’s Signature Theatre. Mia Farrow and Brian Dennehy in Love Letters. Photo by Carol Rosegg. BOTTOM LINE: A high-priced but pleasant and expertly performed revival of A.R. Gurney’s two-character romantic comedy. Melissa Gardner is an eccentric, damaged soul who lives her life outside the lines. Her best friend, Andrew Makepeace Ladd III, is a buttoned-down daddy’s boy who may chafe under the rigid rules of the high society in which he and Melissa live, but who, ultimately, seems to find comfort in those restrictions. Consider that these two are growing up in the WASPy world of Sea-Breeze parties at Yale’s Fence Club, with classmates named Bucky and Bubbles, and it’s not hard to guess which one fares easier in A.R. Gurney’s Love Letters, a late-1980s romantic comedy that returns to Broadway this season. One of the less conventional ways in which Andrew manifests his penchant for order is in his love of writing. “I feel most alive,” he confesses, “when I’m holed up in some corner, writing things down. I pick up a pen, and almost immediately everything seems to take shape around me.” By contrast, the wildness that grows inside Melissa can’t be contained with mere paper and ink. For a play made up almost entirely of letters written between the two, you can guess which one has an easier time of that as well. Director Gregory Mosher brings together a crack design team to this revival, including Tony Award winners John Lee Beatty (sets), Jane Greenwood (costumes), and Peter Kaczorowski (lights). It’s not entirely clear why, however. The set almost literally consists of a table and two chairs. The costumes and lighting cues closely adhere to Gurney’s detailed, minimalist instructions. As pleasant as this production is, it’s not hard to imagine ways it could have kept ticket prices lower than they are. However, the rotating lineup of actors is definitely an attraction here, starting with two accomplished turns from Brian Dennehy and Mia Farrow. Dennehy continues with the production through November 8th, whereas Farrow will be replaced by Carol Burnett on October 11th. Later pairings will include Alan Alda and Candice Bergen, Stacy Keach and Diana Rigg, and Anjelica Huston and Martin Sheen. As the first of these couples, Dennehy and Farrow are seen to their best advantages. Dennehy is a large, charismatic actor who tends to occasionally over-gesticulate onstage; he’s often best when he has to rein himself in and keep things small and simple. 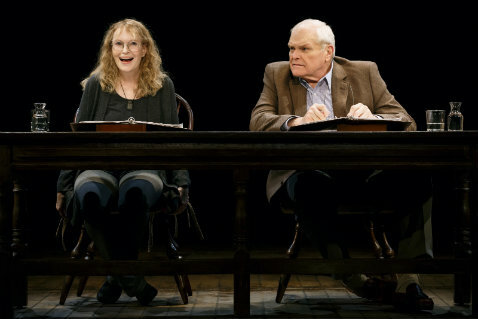 So what could be better for him than a play that features a quietly awkward New England Yankee who spends his full 90 minutes of stage time sitting behind a desk, doing nothing more than tugging at his glasses and taking a sip or two of water? And reading and listening -- which Dennehy does with poignant sensitivity -- as the complex friendship between Andrew and Melissa unfolds over a period of five decades. Farrow, meanwhile, is often at her most masterful playing highly emotional, somewhat unmoored characters, not only in such classic films as Rosemary’s Baby and The Purple Rose of Cairo, but onstage, as with her most recent Broadway performance, playing Honey in a 1999, one-night-only reading of Who’s Afraid of Virginia Woolf? Here, Farrow is once again riveting, giving a steady portrayal of an increasingly unsteady woman. She pulls off the difficult task of making us care for a character who, in lesser hands, could come across as cartoonish and annoying. Farrow, with her piercing blue eyes and still-girlish features, carries us into the heart of Melissa. The play is not essential Gurney. It lacks the sharp, less predictable cultural observations of The Dining Room or The Cocktail Hour, and so, perhaps, relies a little too much on its roster of casting stunts. And it takes an unfortunate turn into sappy melodrama at the end, rather than maintain the beautiful simplicity with which it begins. But it is a moving and often funny tale of a love affair between two sensitive yet divergent people. And it is also the playwright's valentine to the written word, especially to what -- even by the time of its 1988 world premiere in Connecticut -- was the dying art of the written love letter. This would be a decidedly different play if each of the missives that make up its structure were limited to 140-character Tweets.